Wheelersburg senior Sarah Claxon signed her LOI with Georgetown College (Ky.) Monday afternoon to play softball for the Tigers beginning next fall. 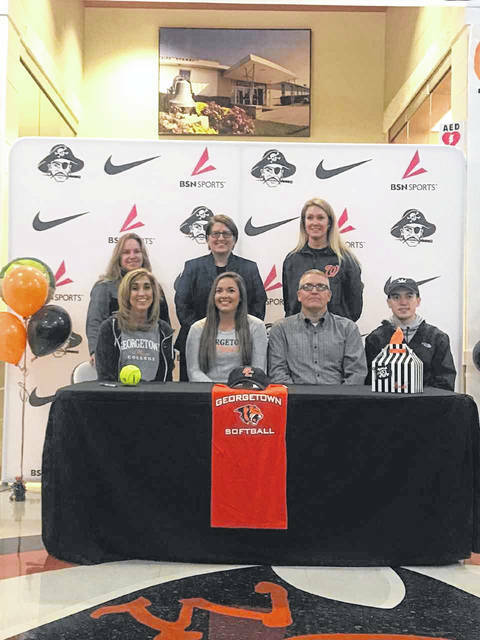 On Monday afternoon, Wheelersburg senior Sarah Claxon signed her letter of intent to play softball at Georgetown College (Ky.) for the Tigers following her graduation in the spring. Claxon has been an integral part of the Lady Pirates success on the softball field over the past few seasons, including as a member of their state championship run in 2016. Georgetown College competes in the Mid-South Conference at the NAIA Division II level. Coincidentally, that is the same conference that Shawnee State University competes in in their athletic competitions. The Tigers head coach, Thomas Thornton, who is entering his 17th season in the head coaching role, believes the addition of Claxon will pay dividends for his team once she joins his roster next fall. Claxon agreed with Thornton’s comments about her visit to the college just north of Lexington and how that visit sealed the deal with where she pursue a post-secondary education and continue her athletic career. Thornton went on to talk about what Claxon can add to his team on the mound from the pitching position when she joins the Tigers roster next fall. Claxon not only has had an illustrious softball career for the Pirates, but she has also been a cheerleader on the sidelines of football and basketball games during her high school career as well. Claxon has goals for herself and her Lady Pirates team that she hopes will translate into achievements during her senior season before she graduates this spring.